“This year has proven to be another catastrophic year for wildfires.Dozens of lives have been lost, thousands of homes destroyed, and millions of acres burned. Congress spoke today and said enough is enough. We must give the Forest Service the tools it needs to stop these fires before they start," said Congressman Bruce Westerman. Catastrophic wildfires are a significant threat to wildlife, watersheds and communities throughout the West. 2017 was one of the worst wildfire seasons on record. More than 58,000 fires burned more than 9.2 million acres. The Forest Service has already spent more than $2.5 billion on suppression costs this fiscal year alone - a new record. The House Committee on Natural Resources reports that in 2016, wildfires destroyed 4,312 structures, including 3,192 residences. As a result of 2017 wildfires, Seeley Lake, Montana set a record for the worst air quality ever recorded there - 18 times greater than EPA’s safe particle limit. Between 60 and 80 million acres of our National Forest System are considered high risk and in need of treatment to address forest health challenges such as fire, insect mortality, and invasive species. Most of this land is located within Western states. While these wildfires typically start as a horrific act of nature, a lack of responsible forest management allows them to grow at unrelenting rates, making it even more difficult for our brave men and women battling these infernos. It is absurd that we allow our forests to become powder kegs that invite bigger and hotter fires every summer. It isn’t a matter of if our beautiful nation’s forests are going to burn—it is only a matter of when. It does not have to be this way. The biggest hindrance is the U.S. Forest Service bureaucracy in Washington and extreme special-interest groups that stop responsible forest management activities. Because the Forest Service refuses to permit hazardous fuel management projects in our forests, they are overcrowded with trees that go up in flames during droughts, and invite massive conflagrations. It would be far easier to thin the forest conscientiously in advance than resort to emergency fire suppression, which risks lives and property. It defies commonsense that the Forest Service has been maxing out its suppression account each year and has been forced to raid its forest management and other accounts in order to put out fires. They’ve had to use resources designed to prevent forest fires in order to put them out. This merry-go-round practice is called “fire borrowing,” and it has dramatically exacerbated the problem of catastrophic wildfires. In fact, eight times in the last twelve years, the Forest Service has moved funds from other operating accounts to fight fire, depleting accounts for forest management in the process. The Forest Service’s own Fuel Treatment Effective Database reports that “over 90 percent of the fuel treatments were effective in changing fire behavior and/or helping with control of the wildfire." Unfortunately, federal land management agencies have failed to recognize this correlation and timber harvests are down 80 percent over the last 30 years. 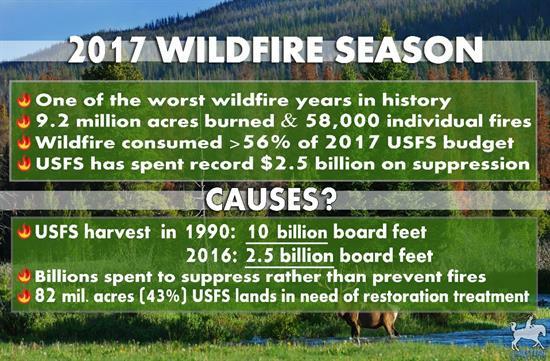 In fact, the Forest Service only harvested 2.5 billion board feet in 2016 compared to over 10 billion board feet in 1990. Only a miniscule percentage of our forests are thinned each year, which is insufficient, and will not solve this decades-old problem. A real solution to this problem is needed so we don’t sit back and watch even more of our beautiful forests get destroyed by relentless wildfires. Special-interest groups claim that we must lock up our forests, and tie the hands of local Forest Service administrators by threatening lawsuits every time a responsible forest management policy is proposed. In fact, litigation and other challenges have caused a significant reduction in active saw mills nationwide, from 1,311 in 1995 to just over 220 today. These litigants have also exacerbated significant destruction of our forests and private dwellings as the environmental degradation these groups claim to want to avoid occurs on a massive scale through air pollution, water contamination, and destruction of species habitat. Robust data from NASA has concluded that one catastrophic wildfire can emit more carbon emissions in a few days than total vehicle emissions in an entire state over the course of a year. H.R. 2936, the Resilient Federal Forests Act, introduced by Rep. Bruce Westerman, is a bipartisan, comprehensive legislation that simplifies the cumbersome planning process and reduces the cost of implementing proactive forest management strategies in order to improve forest health throughout the country. It empowers local stakeholders and decision-making while advancing a forward-thinking active management strategy to combat wildfires before they get started. This bill is a package of forest management reforms that include regulatory expedition for forest management projects, a new arbitration pilot program for court cases in which an injunction against forest management projects is sought, as well as new incentives for agencies to coordinate with state and local governments to seek forest management solutions. The net effect of these reforms will be to reduce the barriers to proactive forest management while preserving environmental protections and the legal right to recompense for harm or breach. H.R. 2936 requires litigants opposing active management projects to propose an alternative proposal as opposed to just saying no. This legislation also removes incentives for extreme special-interest groups to file frivolous lawsuits. The House passed H.R. 2936 and Western Caucus was proud to play a key role. However, our work is not done until we get these important active management reforms signed into law. More HERE. H.R. 1873 reduces fire risks and hazards as well as ensures reliable electricity service by allowing management of high-risk vegetation in close proximity to power lines to occur in and near certain federal rights-of-way (ROW). Electric utilities must seek permission and approval from the appropriate federal land management agency (Forest Service or BLM) for their proposed vegetative management plan. Active vegetative management along these ROWs is extremely important, including the removal of trees, living, dead or dying, which would contact a power line if not properly maintained. In August 2006, three power lines in the Pacific Northwest sagged and came into contact with untrimmed trees resulting in a blackout that impacted 7.5 million people across 14 Western states, two Canadian Provinces and part of Mexico. And in August 2008, a falling tree spurred a blackout for more than 50 million electricity customers across the Northeastern and Midwest states.The bill promotes federal land management agency consistency, accountability, and timely decision-making as it relates to protecting electricity transmission and distribution lines and habitat on federal lands. House of Representatives voted to pass H.R. 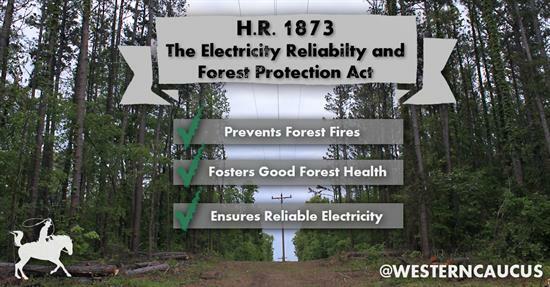 1873, the Electricity Reliability and Forest Protection Act, sponsored by Reps. LaMalfa and Schrader, by a bipartisan vote of 300-118. Click HERE to read more. 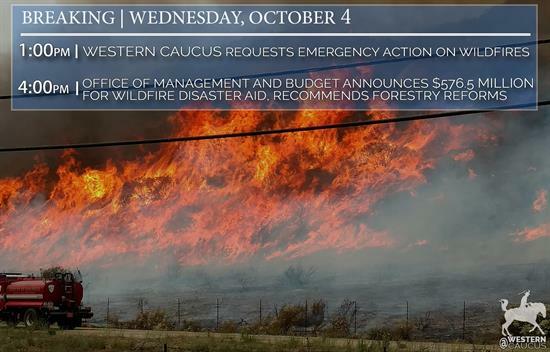 On 10/4/17, 32 members sent OMB Director Mulvaney a letter asking that the Administration send Congress a proposal that includes comprehensive forest management and wildland fire budgeting reforms as part of the next disaster relief request. This effort was successful and resulted in $576.5 million for wildfires and strong active forest management language. 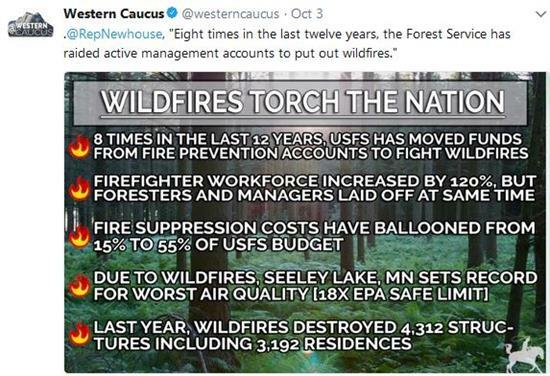 This Western Caucus initiative also prevented the Forest Service from having to raid their active management accounts in order to fund suppression costs. More HERE.